I found this clipping in an old council press scrapbook. I don’t think it would work as a primary document for classroom use! A World War II Service Project that would need major updating to try today. 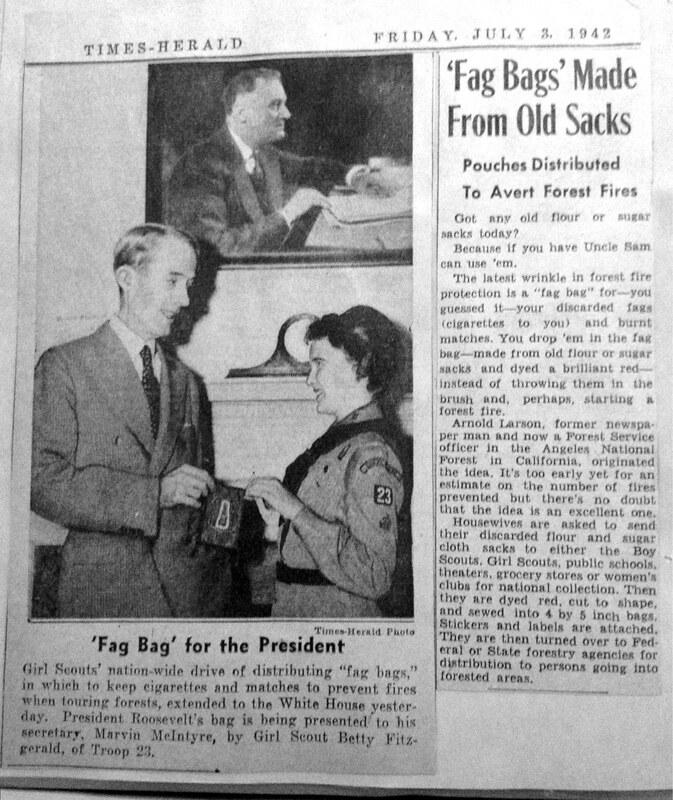 This entry was posted in Archives, Community Service, Scrapbooks, Sensitive Issues and tagged cigarettes, forest fires, Franklin Delano Roosevelt, Girl Scout Council of the Nation's Capital, Girl Scout memorabilia, Girl Scouts, GSCNC, GSUSA, service project, smoking. Bookmark the permalink. It wasn’t poorly named. Fags were cigarettes. Last I heard, GSUSA no longer allows smoking at events with girls. It was a different time. Word change with the times. It is all part of our history and a wondrous history it is! Besides the unfortunate name (a slang term which is no longer in use much), I wonder about the usefulness of putting used cigarettes and matches into a fabric bag. I suppose they mean for users to stub the hot items out in the dirt or in water, let them cool, and THEN put them into the bag? Before reading the article, I was expecting larger bags – for holding bundles of sticks to be used for firewood.